WHAT EVERY WOMAN NEEDS: IS THIS THE WORLD'S MOST EXPENSIVE T-SHIRT? IS THIS THE WORLD'S MOST EXPENSIVE T-SHIRT? IF you thought you had seen it all, then think again. 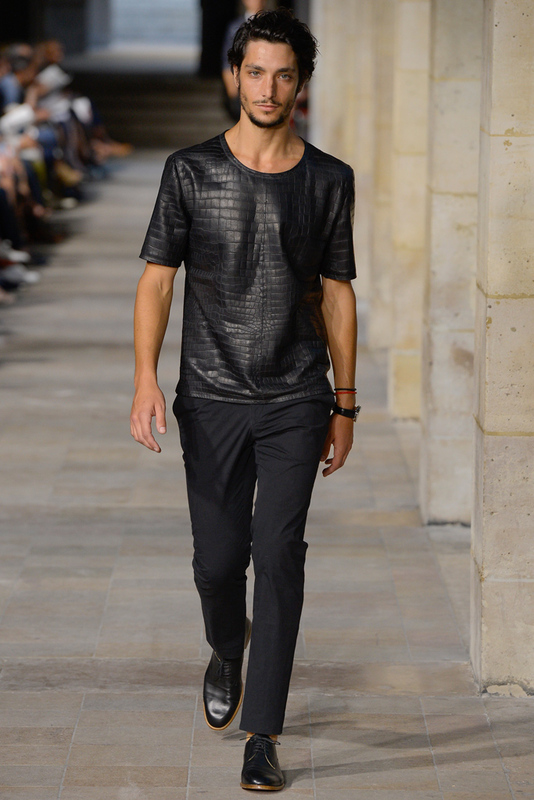 Found hanging among the menswear section in the Hermès store on Madison Ave, New York, was this crocodile leather "T-shirt" (above). With a price tag of $91,500 ... yes that's right $91,500 … it would have to be the most expensive top in the world. That's one helluva croc! Impossible I hear you say! That can't be right others exclaim! Maybe it's a typo. Maybe it should be $9150 or even $915. 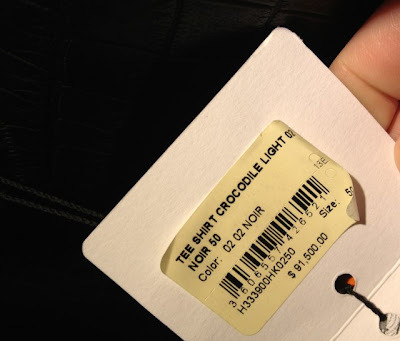 But as reported by New York blog site, The Awl, here, the price tag is clearly seen on the swing tag below. However, I can see the letters HK in the coding, so maybe it was dispatched for Kong Kong but somehow wound up in NewYork! If that was the case, then HK$91,500 roughly converts to about $11,200 US or Australian. Regardless, it's still expensive. To be fair, Hermès (who craft the most fabulous handbags as well as some of my favourite perfumes!) are known for their beautifully made, high-quality products just like other luxury brands. And in typical Hermès style and uncompromising standards, I'm sure the T-shirt is exquisitely made ... maybe even stitched by hand and lined with silk? But it's still just a T-shirt!